Turn off your clothes dryer and save money in the process. Do you wish you could line-dry your clothes indoors? If you don't have a clothes dryer or you want to save on the energy costs, it is an option. Line-drying your clothes outdoors is great, but it doesn't work for everyone. If bad weather, lack of space, or another problem makes it difficult for you to do it outdoors, try line-drying your clothes indoors, instead. Line drying your clothes indoors doesn't have to be an all-or-nothing proposition. 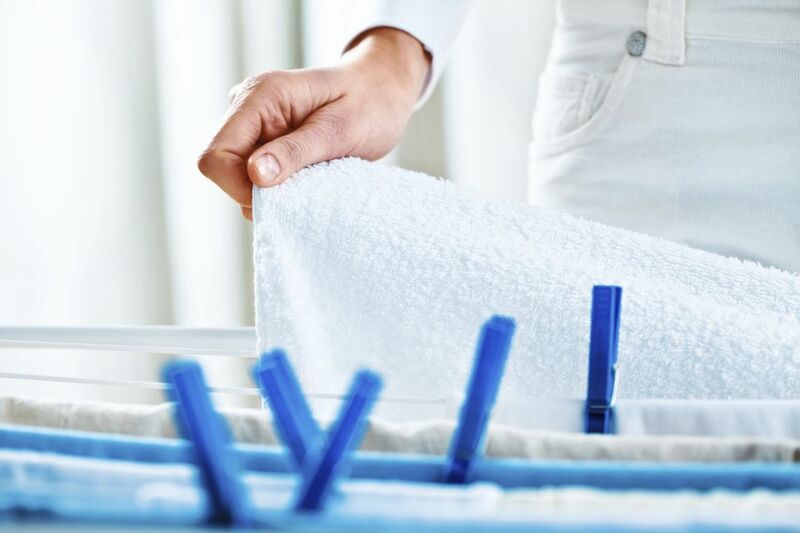 If you're only able to line-dry a portion of your laundry, that's OK.
Look around your house to figure out where clotheslines or drying racks could be placed (without getting in the way). Do you have space in the basement? Could you hang things on the shower rod (and add a retractable line for more hanging space)? Could you set up foldable drying racks in a spare room (and put them away when you're not using them)? Is there space in your laundry room for overhead lines or a collapsible wall rack? If you want to line-dry all of your laundry indoors (or come close to it), try not to let the laundry pile up. Wash and hang clothes whenever you have enough for a load, and you'll minimize the amount of hanging space that you need to get the job done. It usually takes 24 hours for clothes to dry indoors, so you can even do a load a day if your family generates a lot of laundry. The fastest spin cycle will wring as much water out of your clothing as possible. This will speed your drying times considerably. If you have a top-loading machine, consider replacing it with a front-loader when your current machine dies. The spin cycles are much faster—sometimes twice as fast. Leave space between items on your clothesline or drying rack, so everything will dry as quickly as possible. Also, run a small fan to keep the air circulating. Placing your racks and lines near an air vent, heat source, or dehumidifier is another good way to speed up the drying process. Keep your racks a good distance from walls, so you don't create an environment for mold to grow. This way your clothes will be drying while you sleep. On dry days, they may be dry when you wake, but even on wet days, you'll have fewer hours to deal with laundry hanging around your home. Many utility companies offer cheaper rates during off-peak hours, so it could also be a way to save on the cost of washing your clothes. Cut down on the amount of laundry you have to do by wearing pants, skirts, and layering pieces more than once. Also, you might be more motivated to line-dry your clothes when you find out how much it costs to run a dryer. If you prefer to dry your clothes outside, learn how you can solve common outdoor line-drying problems and then give it a try. And whether you're line-drying your clothes indoors or outdoors, you can apply some simple trick to keep you line-dried clothes from getting stiff.